A map game requires the arrangement of the game’s elements on a plane according to their relative compass directions (north, south, west, and east). These games, like the circular games we just looked at, are similar to the linear spatial arrangement games we’ve already studied. Like those, we are ordering elements according to their relative positions. The complication is that there are two criteria for ordering: a north-south component and a west-east component. These two ordering processes must be considered simultaneously, which is why these problems are challenging. Map games require the arrangement of elements onto a plane according to their relative compass directions. Create a quadrant with north at the top, south at the bottom, west to the left, and east to the right. Determine which element to select as your central element – it should be the element for which you have the most information. Place the central element at the center of your quadrant map. Place on the map any additional elements which relationship to at least one other element is known. Indicate this relationship with an arrow. Read the question and add any additional information to the map. When choosing an answer, be sure that you can draw a map that reflects the most information. Let’s begin by working through a sample game. Within a county, there are six cities, L, M, N, O, P, and Q. The location of these cities relative to each other is as follows: Q is further north than P. P is further west than O. L is further north than P. M is further east than P. N is further west than O. As with our previous game types, we can begin with the roster and then summarize the rules. 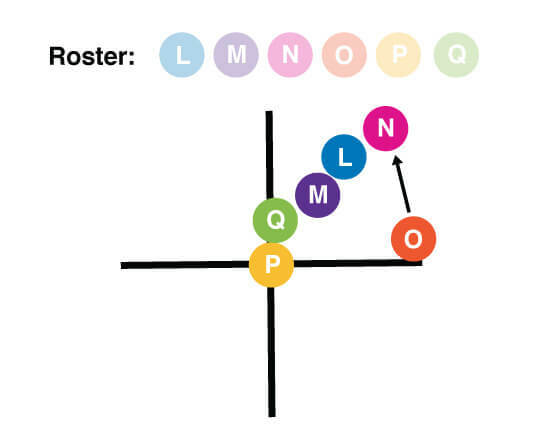 (Roster = L, M, N, O, P, and Q.) Next, we are going to try to construct a diagram to enable us to solve this problem. First, however, we must be sure to read the premise and conditions extremely carefully and precisely. How about when Q is further north than P? Q is more north than P, but does it mean that Q is directly north of P? No. Q may be further west or east than P, and we cannot determine that from the information given to us. Like the circular arrangement games, map games often involve conditions that describe relative spatial arrangements, not fixed positions. We will construct a map that indicates the relative positions of the elements. Now that we have constructed this map, let’s look at the questions. (1) A person leaving N and driving in a southwest direction on a single, straight road, might pass by which of the following cities, in the order given? If our map indicated exact locations, it would appear that the only other city that could be encountered on a southwest route from city N would be city P. This is not one of the choices. We know that it is west of O. A road leading from N in the southwest direction could never encounter O. We can eliminate all answer choices that include O, choices A and D. Next, let’s tackle the remaining answer choices, one at a time, using what we know about the relationships between P and the other cities. Choice B offers L, P, and M. L is north of P, so encountering L before P would make sense if a person were to travel in a southwestern direction. If we look at our map, we see that M is east of P, not west. Thus, this linear sequence of cities would be impossible, and we can eliminate choice B. Next let’s look at choice C: Q, M, then L. This one does not contain any of our fixed elements, that is, it does not contain our central element, nor does it contain the other two elements for which we have relative location information. Let’s look at the last choice, E, which has the sequence L, P, and Q. Again, let’s start by looking at the relationship between L and P. We know that L is north of P, which is consistent with L being encountered first. What about P and Q? We know that Q is actually north of P, which is not consistent with it being encountered after P on a southwestern route, and we can eliminate this possibility. To confirm that choice C is correct, let’s see if we can rearrange the map to reflect the necessary route (southwest from N) while still maintaining the appropriate relationships between the central element, P, and the surrounding cities. We can maintain the necessary relationships to P (and that of N to O, represented still by the arrow) and allow a southwestern route from N to contact these three cities in the order described in choice C.
(A) City P is further south than city O. (B) City Q is further west than city P.
(C) City O is further east than city Q. (D) City N is further north than city P.
(E) City L is further south than city O. To begin addressing this question, first add the new information to the map; that is, we must either reposition city N or reposition city Q. When we do this, we must also draw an arrow indicating their known relative positions (that city Q is directly north of city N). Does our new map indicate that Q is east of L? Or that Q is north of O? No. The only spatial relationships that we know of are the relationships of the cities and the relationships between N and O, and Q respectively. Keep in mind that the correct answer will reflect either a relationship described in the original conditions or it will reflect the new condition given in the question. We know that Q is north of P, so Q is north of both N and P. From that, can we deduce anything about the relationship of N and P? No, so we can eliminate choice D for this reason. We do know that N is west of O. If Q is north of N, it too must be west of O (and O is east of Q). This is the correct choice, C, the only answer choice that describes a relationship that we can confirm as true given the information provided.